Jack Nicholson as Randle Patrick McMurphy in One Flew Over the Cuckoo's Nest, released in November, 1975. Jack Nicholson is the most recognizable star of his generation — or any other for that matter. Nicholson has given many unforgettable performances over the years, and has never revealed his process. He seems to be a true natural, but we just never see him sweat. Nicholson's upbringing was unusual. He was born to June Nilson in April, 1937, but, unsure of who the father was, gave him over to her parents, John and Ethel, to raise, with June acting as his sister. Ethel raised the boy as a Roman Catholic, and ran a beauty shop in Spring Lake, New Jersey on the town's "Irish Riviera." Attending Manasquan High School and being called "Nick," young Jack seems to have been a discipline problem. Graduating in 1954, Jack lit out for Hollywood (! ), first finding office work at Hanna-Barbera (! ), and leaning to act with the Players Ring Theatre. Small parts on television followed, leading to his making his film debut with producer Roger Corman in The Cry Baby Killer (released in August, 1958), where he received second billing. In 1957, Nicholson joined the Air National Guard. After training at Lackland, in San Antonio, Texas, Nicholson spent the next four years as a reservist at Van Nuys, where he was able to continue working with Roger Corman, most notably in The Little Shop of Horrors (released in August, 1960). He was discharged in 1962. Corman was making a series of films based on the works of Edgar Allen Poe. Nicholson played Peter Lorre's son in The Raven (released in January, 1963). Nicholson was cast in the ensemble of the Mister Roberts sequel, Ensign Pulver (released in July, 1964), but found breaking into Hollywood studios was not forthcoming. Returning to Corman's studio, Nicholson was given the second lead in Hells Angels on Wheels (released in June, 1967). Encouraged by Corman, Nicholson wrote a script for The Trip (released in August, 1967), which starred Peter Fonda and Dennis Hopper (and also grossed 100 times its production cost). This led to his playing a hippie in Psych-Out (released in March, 1968). Nicholson's breakthrough came with Easy Rider (released in May, 1969 at the Cannes Film Festival), with Fonda and Hopper. Nicholson's performance as an addled smalltime lawyer was a standout. The film was enourmously popular, making Nicholson a counter-culture star over night. Before that could happen, however, he would have to appear in director Vincete Minnelli's On a Clear Day You Can See Forever (released in June, 1970), as Barbra Steisand's step-brother. Their duet together was cut from the film. His first real starring role came with Five Easy Pieces (released in September, 1970 at the New York Film Festival), with Karen Black. Produced on a shoestring, the film was successful enough to allow Nicholson to direct a movie about one of his passions: Basketball. Drive, He Said (released in May, 1971 at the Cannes Film Festival), starring William Tepper, flopped. Nicholson's persona onscreen continued to shape itself in Carnal Knowledge (released in June, 1971), and The Last Detail (which played the Chinese in February, 1973); Nicholson, perhaps more than any actor before or since, introduced filmgoers to oceans of profane language in his films. He got together with Last Detail writer Robert Towne and Paramount boss Robert Evans and director Roman Polanski to create Chinatown (which played the Chinese in June, 1974), The atmospheric detective film has become a classic. Nicholson surprised everyone by taking a supporting role in the rock opera Tommy (released in March, 1975), with Ann-Margaret. Another project with director Mike Nichols and Warren Beatty did not fare well; The Fortune (released in May, 1975), became Nicholson's first disaster at the box-office. It remains an acquired tatse. 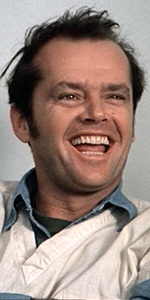 Audiences did not have any difficulties with his career-high role as Randle Patrick McMurphy in One Flew Over the Cuckoo's Nest (released in November, 1975); the popular film won the Best Picture Oscar, with Nicholson winning the Best Actor Oscar as well. His next film, the western The Missouri Breaks (released in May, 1976), with Marlon Brando was a huge flop at the box-office. Undaunted, Nicholson decided to star in and direct the western-comedy Goin' South (released in October, 1978), introducing audiences to Mary Steenburgen in the process. Nicholson, along with many of the "new Hollywood" figures, shared a sense of making mainstream films, along with more personal projects. Straddling this divide for director Stanley Kubrick resulted in The Shining (which played the Chinese in June, 1980), then, he played playwright Eugene O'Neil for director Warren Beatty in Reds (which played the Chinese in December, 1981). Terms of Endearment (which played the Chinese in December, 1983), with Shirley MacLaine, and for which he would win an Oscar for Best Supporting Actor, followed by Prizzi's Honor (released in June, 1985), and The Witches of Eastwick (released in June, 1987). He would reunite with Terms of Endearment's director, James L. Brooks, to play a television network executive in Broadcast News (released in December, 1987). Nicholson's biggest summer blockbuster film came with his playing The Joker for director Tim Burton in Batman (which played the Chinese in June, 1989). Another significant role was in A Few Good Men (released in December, 1992), with Tom Cruise. The December Nicholson undertook the title role in Hoffa (released in December, 1992), while the Summer Nicholson starred in the supernatural romance Wolf (released in June, 1994), with Michelle Pfeiffer, and the December Jack played a bizarre president of the United States for Tim Burton in Mars Attacks! (released in December, 1996). Nicholson won another Best Actor Oscar for As Good as it Gets (released in December, 1997), with Helen Hunt, which became a huge hit. Nicholson turned tables on his Cuckoo's Nest performance by playing a psychotherapist to Adam Sandler in Anger Management (released in April, 2003). After the rom-com Something's Gotta Give (released in December, 2003), with Diane Keaton, Nicholson finally worked for director Martin Scorsese in The Departed (which played the Chinese in October, 2006), with Leonardo DiCaprio, then did the light comedy The Bucket List (released in January, 2008), with Morgan Freeman. He reunited with director James L. Brooks for How Do You Know (released in December, 2010), with Reese Witherspoon. Mann's Chinese Theatre, Hollywood, California. Jack Nicholson Forecourt ceremony, Monday, June 17, 1974. Nicholson flashes his trademark smile as cement artist John Tartaglia looks on.